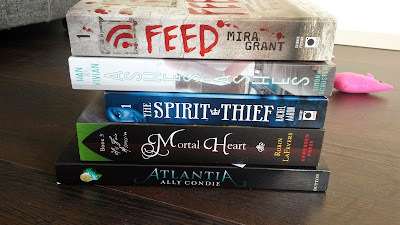 -Feed by Mira Grant: Huge thank you to Ciska from Ciska's Book Chest, who is a fellow Dutchie and generously donated a prize to Dewey's Read-a-Thon that I just happened to win :) I'll be reading this one soon for book club, I'm slightly unsure about reading another zombie book, but I've heard really good things about it, so we'll see. -Ashes To Ashes by Jenny Han and Siobhan Vivian: I really need to read this after the ending of Fire With Fire!! -Mortal Heart by Robin LaFevers: I REALLY need to start this series, cause my friend Mel keeps raving about it and it sounds amazing. -Atlantia by Ally Condie: it sounds interesting and it's a standalone, so should be fun. -Crimson Bound by Rosamund Hodge: EEEEE!!! SO much love for Cruel Beauty!! I'm beyond excited to read this one! -Things We Know By Heart by Jessi Kirby: How could I not click the request button for this one?? Jessi Kirby's Golden blew me away and I still cannot stop raving about it. Also, this sounds heartbreaking, so I'm in. -Magonia by Maria Dahvana Headley: this just sounds like my kind of book in all its epicness. -Heat of the Moment by Lauren Barnholdt: I usually love Lauren Barnholdt's books, and this series sounds really good! My wife is a huge fan of the Feed series! She's not really into zombie books, but seeing it the book shop with the rss feed logo and reading the summary, she decided to pick it up. As a fellow journalism major she thoroughly enjoyed the style Mira Grant decided to go with the writing. Hope you enjoy it! Also Feed is amazing! :D Enjoy it! Wow, Feed looks so pretty...I've been waiting a long time to get my hands on that one! Oooo. Mortal Heart is so good. I hope you enjoy. The Robin LaFevers series is AMAZING!!!! You really do need to read it! I got Mortal Heart the other week and really need to pick it up ... I loved the last book!